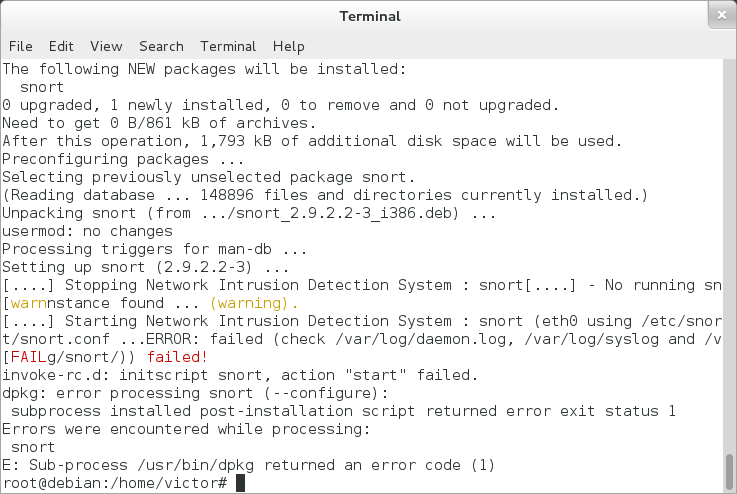 I recently tried installing Snort on a Debian system ( apt-get install snort ) and while installing, the associated service couldn’t start which led to a dpkg error. I’ve checked the snort.conf file and everything was ok. My network card was functional and i had network connectivity. I then looked in the /var/log/daemon.log file like the error suggested. Now everything seems understandable. Note to self – always check log files. I then installed the snort-mysql package and it worked. Week 2 was about an early development phase, where i just install necesary software and play around to see what posiblities i have. 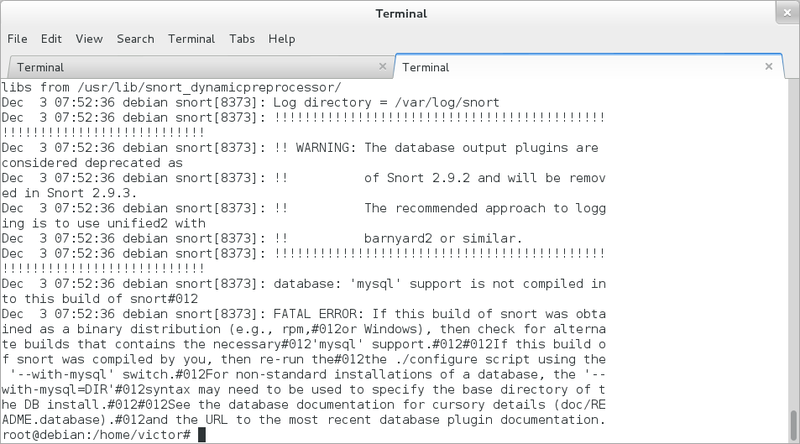 – install Snort with a front-end interface and start playing with to see what can i do. You can read a detailed walkthrough here. It took much more longer than i expected, because of the lack of proper documentation related to the acidbase software and things simply not working. This turned out to be a total waste of time, becase it was too much of a hastle and i didn’t acomplish anything. – setup a test environment with a server/PC running a Snort and a front-end solution, a hub and some machines that can generate traffic. I can get the traffic needed from another class that has a networking project running. Initially, i wanted to use a pfsense powered machine that can mirror traffic from the network to me. I ran into more problems than i expected but you can read about it here. I needed to install Snort and a nice GUI for it for one of my projects. I have used a virtual machine running Debian 7. I have followed some tutorials but none of helped me install everything succesfully. I ran into some weird errors but i managed to fix them. As part of my current education, i have to specialise and gain more knowledge in my AP degree field, which is IT Networking with everything related – IT security, python programming, php programming, linux etc. My subject is – Network monitoring solution for small/medium size companies.